Theodore Roosevelt was the 26th President of the United States of America, the symbolic leader of the country. His presidency began in 1901 and ended in 1909. He was 42 years old when he first began his term of office on September 14, 1901. Theodore Roosevelt was the distant cousin of Franklin D. Roosevelt who became the 32nd US President. 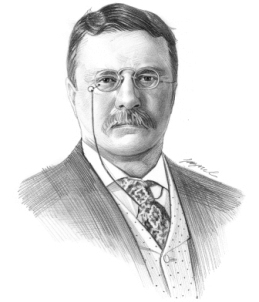 Theodore Roosevelt was named after his father and often referred to as "Teddy", although he loathed being referred to as such. The toy teddy bear was named for him following the publication of a cartoon that showed him sparing the life of a bear cub while hunting. He had a variety of other nicknames including The Rough Rider, The Cowboy, Rough and Ready and The Trust Buster. The picture of Theodore Roosevelt portrays an interesting image of what this famous man looked like. The picture shows the clothing and the hairstyle that was fashionable during his presidency. He is described as a robust figure of a man being 5 feet 10 inches in height and 210 pounds in weight. He had blue colored eyes and his hair was brown that turned slightly gray with age. He wore a long, bushy moustache and pince-nez spectacles that were popular in the 19th century. Pince-nez spectacles are supported without earpieces, by pinching the bridge of the nose. His face would light up with his toothy smile. Theodore Roosevelt was conscious of his public image and wore fashionable and expensive clothes. Character and Personality Traits: What was Theodore Roosevelt like? The personality of Theodore Roosevelt is described as a total extrovert who loved, and craved, the limelight. He was highly ambitious, brave an charming. His charismatic personality appealed to both men and women and he was a highly popular president. He was forceful and decisive and had good oratory skills, his words were emphasized by various gestures. He was an intelligent man and had the great advantage of a photographic memory which gave him the ability to recall text, images or objects in memory with great precision. The important role and duties of the President of the United States of America include those of Chief of State, Chief Diplomat, Chief Executive, Commander in Chief, Legislative Leader and Leader of his own political party. What was Theodore Roosevelt famous for? Why was Theodore Roosevelt important? The history and life of President Theodore Roosevelt during his presidency is conveyed in the following fact file in an easy question and answer format. What President was Theodore Roosevelt? He was the 26th President of the United States of America. The dates of his presidency began in 1901 and ended in 1909 (September 14, 1901 to March 3, 1909). What other political offices did Theodore Roosevelt hold before his presidency? What was Theodore Roosevelt' nickname? His most famous nickname was "The Rough Rider"
Who was Theodore Roosevelt' s first lady? Theodore Roosevelt was famous for the events and accomplishments of his presidency, but what are the facts about the man and his private life. Facts and information about the private life of Theodore Roosevelt can be found in the following fact file in an easy question and answer format. When and where was Theodore Roosevelt born? Where was Theodore Roosevelt educated and what was his religion? What did Theodore Roosevelt do before he became President of the United States? Who was Theodore Roosevelt' wife and when did they marry? Did they have kids? When did Theodore Roosevelt die? We hope that the picture, facts and information on President Theodore Roosevelt will prove helpful to kids, school children and schools learning about the presidency of this famous American leader. The facts about Theodore Roosevelt provides an overview of the President's character and personality traits. Watch the video and learn more about the major events of his life and his accomplishments. The following Theodore Roosevelt video is a useful educational resource for kids, children and schools learning about the life of the US President Theodore Roosevelt.